MISSION, KS--(Marketwired - Jun 19, 2015) - (Family Features) Grilling season is already in full swing, but there are plenty of options to take your grilling menus to another flavorful level. 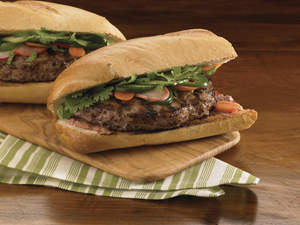 One example is the unique combination of flavors found in the Vietnamese banh mi -- a sandwich layered with savory grilled meat, crisp vegetables and a touch of spice atop a crusty baguette. Italian: Enjoy sausage with roasted peppers or with marinara sauce instead of your favorite condiment. Or serve up this flavorful sandwich, which incorporates crunchy red and bell peppers, with juicy Johnsonville mild Italian sausage links. It's sure to be a hit around your backyard grill.